Just hours after arriving in Hamburg, I climb to the top of the city. 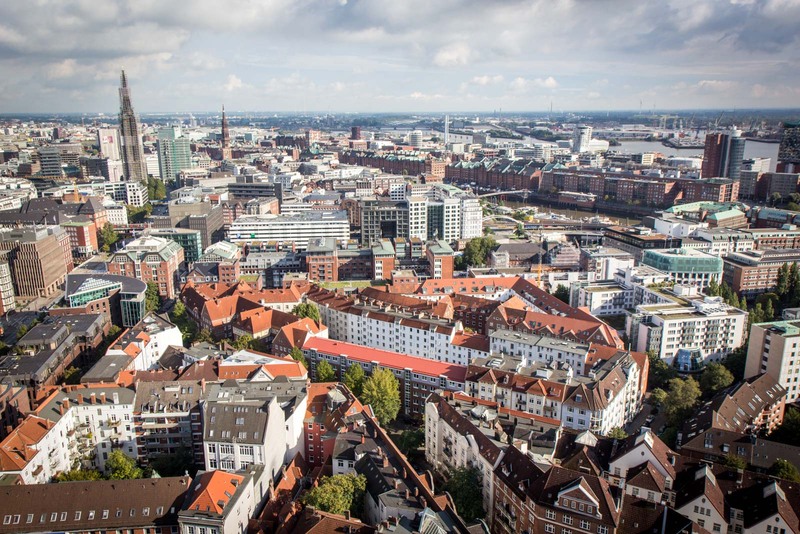 One of its most prominent landmarks, St Michael’s Church, is 132 metres high and it’s from here that you get one of the best views across Hamburg in every direction. Even from above, you can see how diverse the city is. There is no one single narrative that I can apply to Hamburg. It has old stories and new stories. Tales of tradition and tales of innovation. Nature and urbanity; debauchery and relaxation; water and land; local and international. It is so hard to describe Hamburg with any word other than ‘diverse’. And it’s from this viewpoint that you can see it all in the one 360-degree panorama. Over the days that I spend in Hamburg, I start to investigate each of these elements in further detail. I’m fortunate enough to start my visit with an afternoon tour with Steffen from Waterkant Touren. 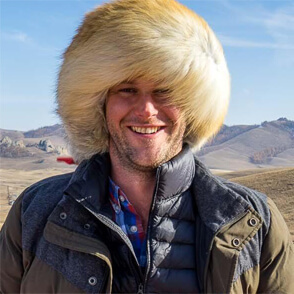 He co-founded the company earlier this year to give tourists intimate and alternative tours through the non-tourist highlights of Hamburg. He tells me that the tour should feel like a group of friends exploring together. The fact that you’re driven around in a 1985 Volkswagen van makes it even better, if you ask me. Steffen gives me a good overview of Hamburg that I use as my roadmap for the following days, explaining that the city is divided into neighbourhoods that have distinct atmospheres and are vastly different from each other. 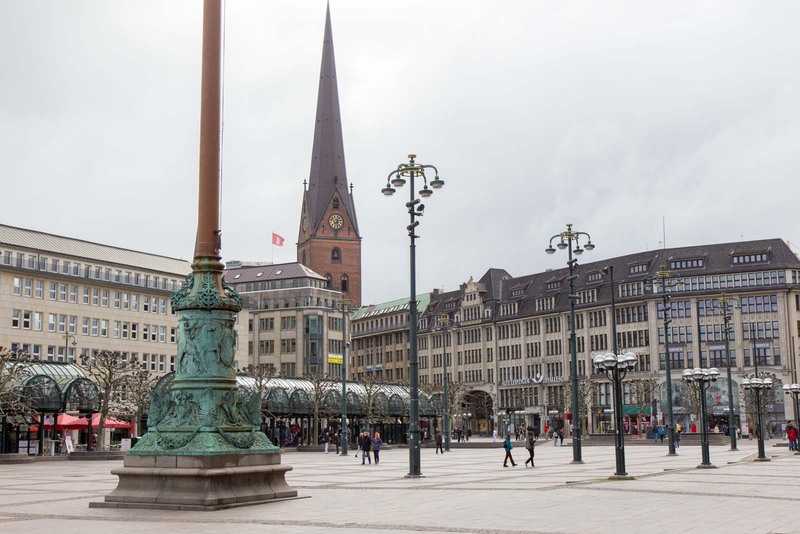 Hamburg feels relatively small (especially for Germany’s second-largest city) and is easy to navigate on public transport. It means that within minutes you can jump between a casual hipster neighbourhood and a modern port development. Hamburg also feels remarkably ‘local’, rather than touristy. That’s not to say it is extremely German – there is a large international population living and working here at any given time. What I mean is that it has more depth than just a collection of landmarks and tourist sites. I first feel this when I spend some time in the Sternschanze district. The leafy streets have a suburban feel and a small football field across from the train station has a local weekend game going on when I arrive. But one of the main streets, Schulterblatt, is full of people in the cafes and bars. They sit outside in the sun with the friends or alone inside, working on their computers. They linger over a cup of coffee and settle in for the afternoon. I’m told that this is one of the most popular areas for young Hamburg locals to go out in the evenings. 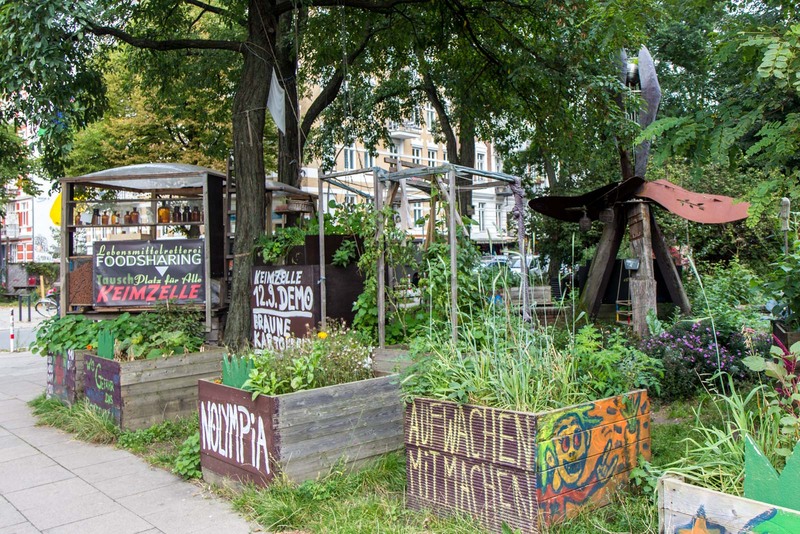 Sternschanze has an alternative and creative feel, with street art and independent shops. But it is also becoming more mainstream as the years go on. To find a more eccentric part of the city, you only need to take a short stroll to an area called Karolinenviertel. This is where the small boutiques and local artists are truly independent and alternative. It’s a small area – just a few blocks in reality – and is covered in art. 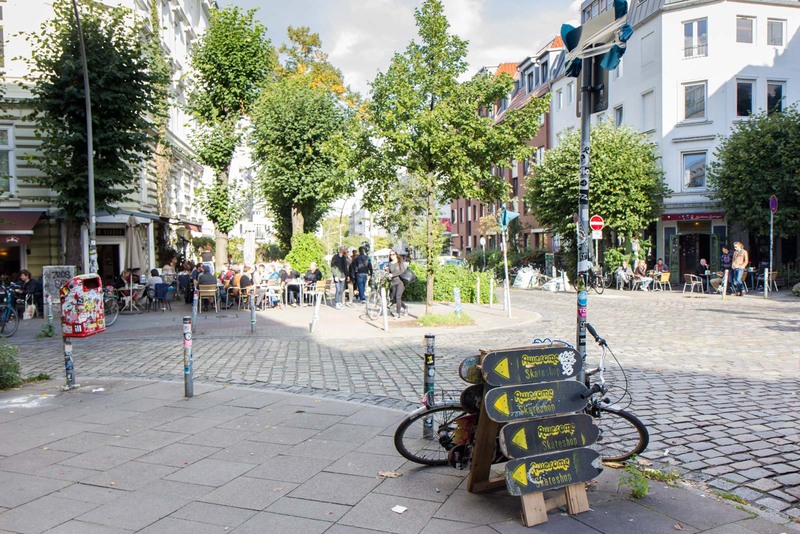 There’s plenty to see in the shops and cafes of Karolinenviertel and some fantastic shopping. If you continue a little further south, you hit the Reeperbahn, the notorious red light district of Hamburg where the parties go all night. As far as red light districts go, Hamburg’s is relatively safe and the focus is more on having a good time than causing any trouble. During the day it’s quiet and always looks like it’s nursing a bit of a hangover. When the sun falls, though, the neon lights come on and the strip comes to life. It’s amusing to see guides taking large groups of visitors on walking tours of this area as the partying begins. It’s just a short walk further south from the Reeperbahn to the Elbe and the riverfront part of the city. This has been developed in recent years into a tourist-friendly area where you can walk along the water and stop at the restaurants and bars along the way. The famous Sunday morning fish market is here and the cruises through the port leave all throughout the day and evening. Heading east along the riverfront, you eventually hit the Old Town of Hamburg. The city was a powerful base during the years of the Hanseatic League and the wealth is still evident in the old architecture of this district. The impressive Town Hall is probably the pinnacle of this, with the detailed decorations of its Renaissance Revival facade. The churches here with their tall spires reaching to the sky are another symbol of the power that was held in this critical trading city. One of the more interesting historic areas is just south of Hamburg’s Old Town. 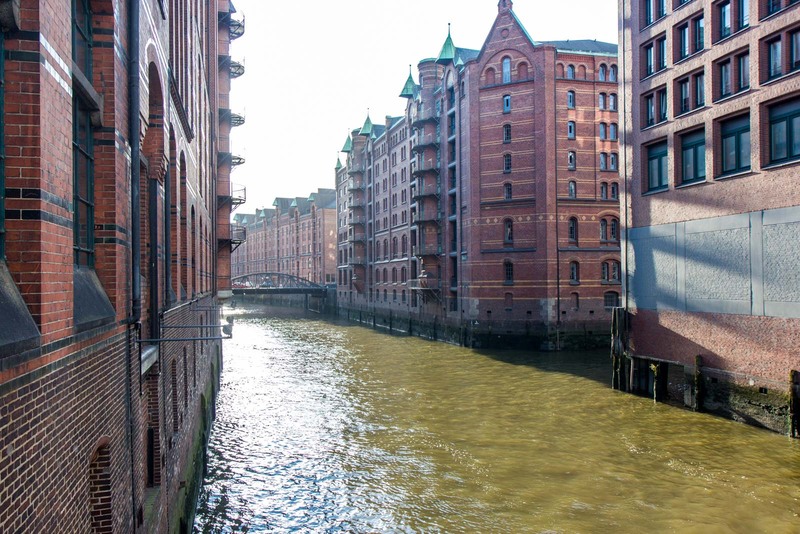 It’s called the Speicherstadt and is the former warehouse district for the port. It was built in the late 19th and early 20th centuries but most of the buildings today are used as offices, shops or museums (such as the wonderful Miniatur Wunderland). Like much of the city, the old has been incorporated into the new. The maritime history and the centuries of trade have been protected but those spaces are now being occupied by tech start-ups and marketing firms. And finally, I come to HafenCity. The newest and (in many parts) the still-to-be-built district of Hamburg. This is the ultimate in urban regeneration. A large part of the port that is no longer needed is being turned into a commercial and residential development that is currently the largest rebuilding project in Europe. Some parts are already finished and these slick new buildings have appropriately hip restaurants, cafes and hotels in them. But when you look around, there are still plenty of large empty spaces where buildings will continue to appear for the next decade or two. All of these different neighbourhoods – from the hip to the old, from the trashy to the glitzy – they are what makes Hamburg what it is. A cool and cosmopolitan city with a strong link to the past. It may be many different things in one but that hasn’t given it an identity crisis. That is the identity of Hamburg today. Time Travel Turtle was supported by the German National Tourist Board but the opinions, over-written descriptions and bad jokes are his own. I reckon Hafencity will be really cool, based on what I’ve seen already. But it’s a really long project and it will be interesting to see if the people and the businesses that move in there have a big impact on the feel of the place as it goes along. There’s already a bit of concern from locals in Hamburg that the area is too expensive for most people to live in. Nice post! Karolinenviertel looks so cute and unique; it would be a great place to get a feel for a real independent feel of a part of German culture. 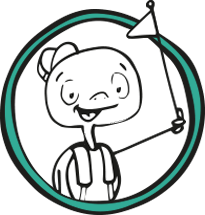 I love the idea of a tour company dedicated to travelers looking for uncommon, non-tourist spots! There are some really cute little parts of Hamburg and, although you can explore them yourself, I think it’s much better to have a local showing you some of the interesting places within them. That’s why this worked out quite well for me!